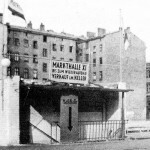 The Marheineke market hall in 1925. 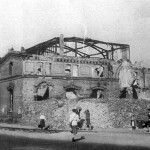 Only the western front building and the burnt-out roof framework are left standing: The Marheineke market hall after being bombed in World War II. New beginnings: Starting over in the cellar of the destroyed market hall in 1945. 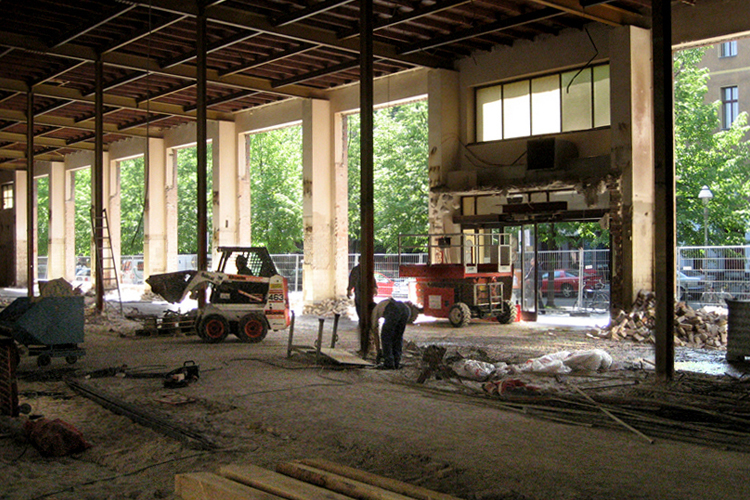 The market hall is rebuilt. 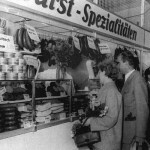 Market stand with sausage and meat products. 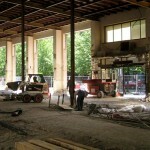 … large windows and entrances are installed on the south side. … and outside the hall on the market hall terrace. 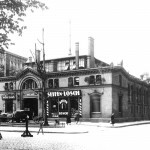 They concluded an agreement with the “Deutsche Baugesellschaft”, whereby the company committed itself to set about immediately building eleven market halls. 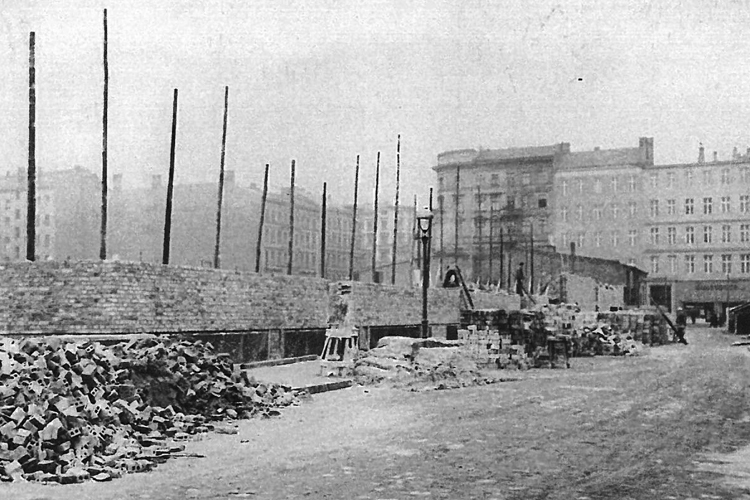 While it took some time before the City of Berlin managed to purchase the first properties for the construction of the markets, from that point on the municipal authorities proceeded to build a network of fourteen market halls within nine years. This largely covered Berlin’s supply needs in those days. The covered market square known as “Markthalle Nr. XI” at Marheinekeplatz in Kreuzberg’s Bergmannkiez neighbourhood was constructed in 1891 and was formally opened on 15 March 1892. 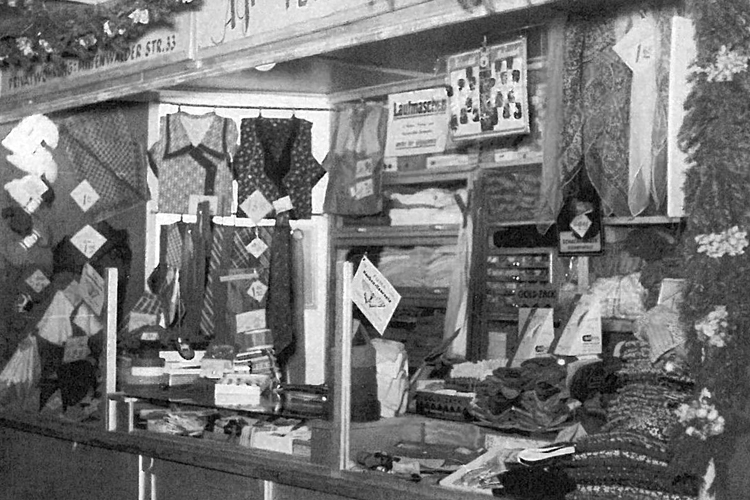 This market hall, with its nearly 2,500 square metres of overall floor space and its 290 market stands measuring four square metres each, was quickly accepted as a “modern” market and was regarded as one of the city’s best municipal market halls. The market halls could not entirely escape the two subsequent world wars. 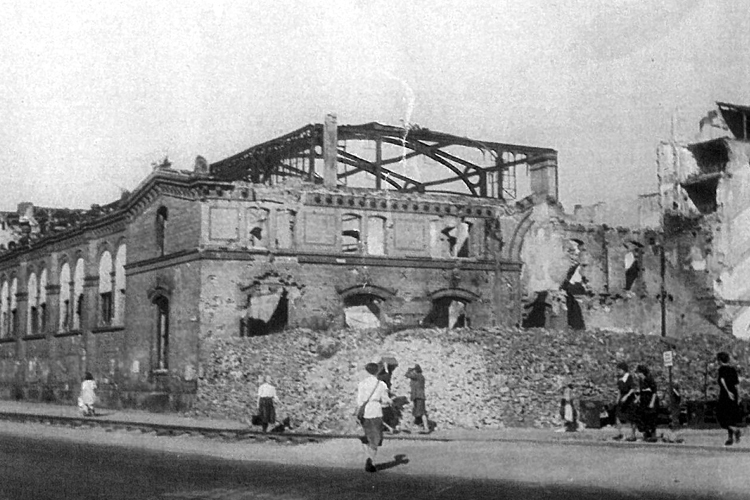 Many structures fell victim to the bombing raids over Berlin. 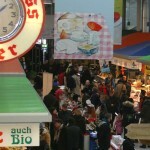 Markthalle Nr. XI was also severely damaged in the Second World War – only the front section on the western side and the cellar remained largely intact. But it wasn’t long before the cellar level gained a new lease on life: Individual tradesmen opened shops there, so that regular market operations began developing in the cellar area. 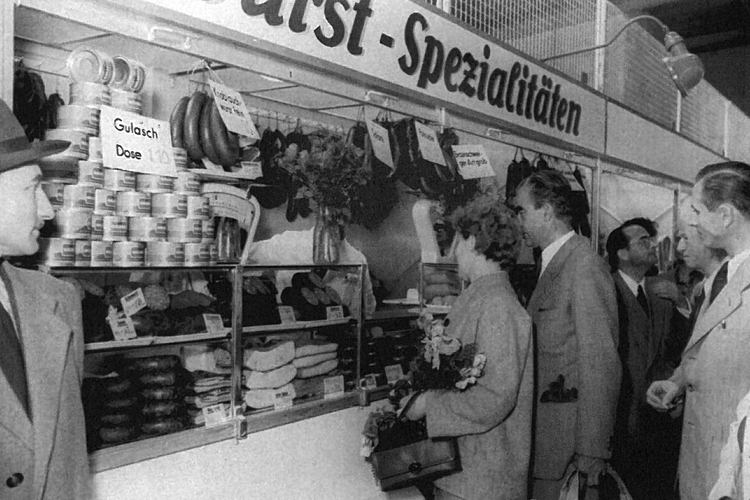 In subsequent years the merchants founded their own syndicate and persuaded the Berlin Senate to rebuild the market hall in the early 1950s. 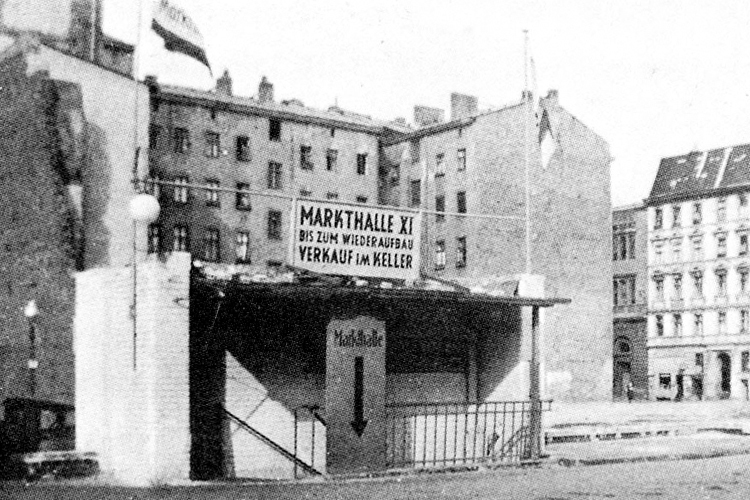 In 1969 Markthalle XI and the market halls on Eisenbahnstrasse in Kreuzberg (SO 36) and on Arminiusstrasse in Moabit were transferred to Berliner Grossmarkt GmbH. 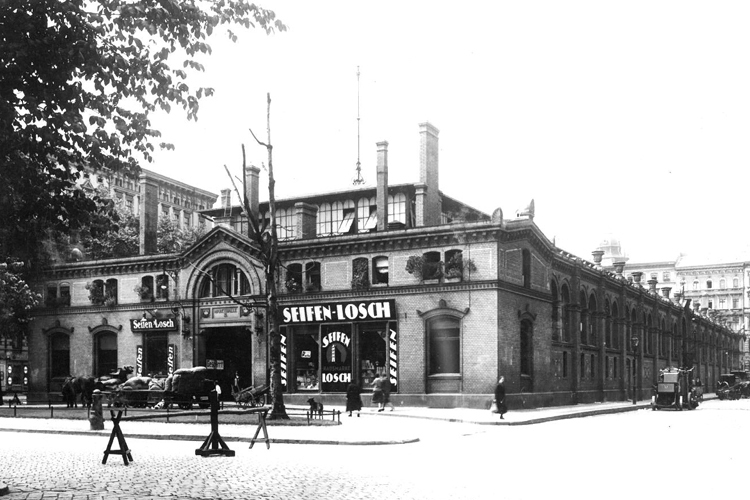 The merchants in these three market halls founded a joint cooperative and rented the three markets from Berliner Grossmarkt GmbH for their own independent operations. 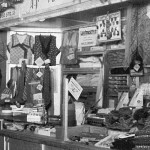 The cooperative existed for thirty-four years. 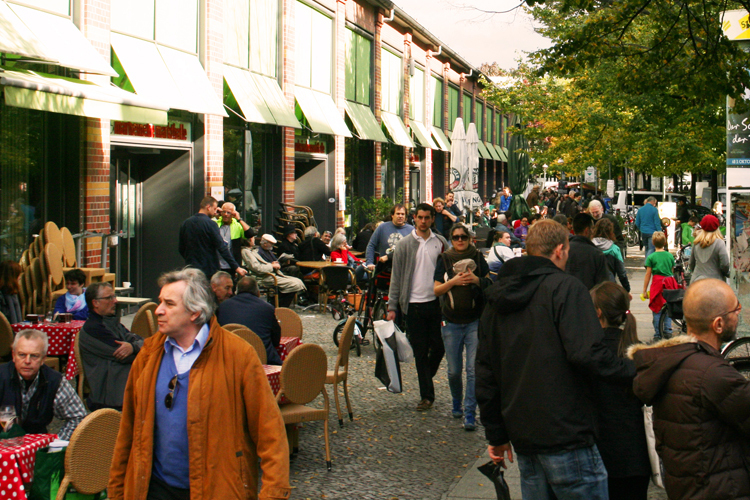 In 2003 Berlin Grossmarkt GmbH took over the market’s operations as the building’s owner and in 2007 it decided to undertake a comprehensive renovation of Kreuzberg’s Marheineke market hall. 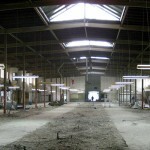 The start of the remodelling phase ushered in the planners’ actual masterpiece: On 13 January 2007 a portion of the merchants moved to a container village for eleven months. 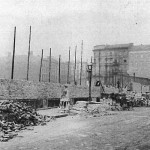 It had been built around Marheinekeplatz. 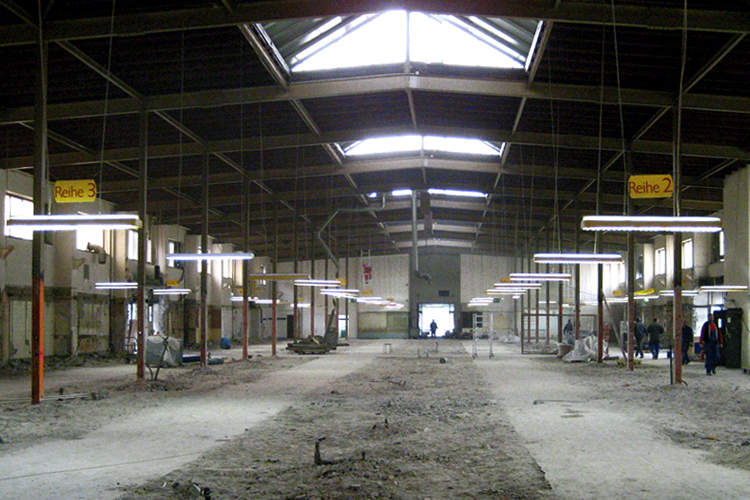 The merchants moved back into their hall in time for the reopening of the “old/new” market hall on 1 December 2007. 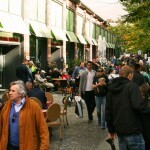 The successful renovation transformed the Marheineke market hall into one of Germany’s most modern markets: It has large and bright windows, numerous entrances, modern and hygienically impeccable restaurant facilities, exclusive retail areas and a gallery where a radio station and an art exhibition have established themselves over the years. 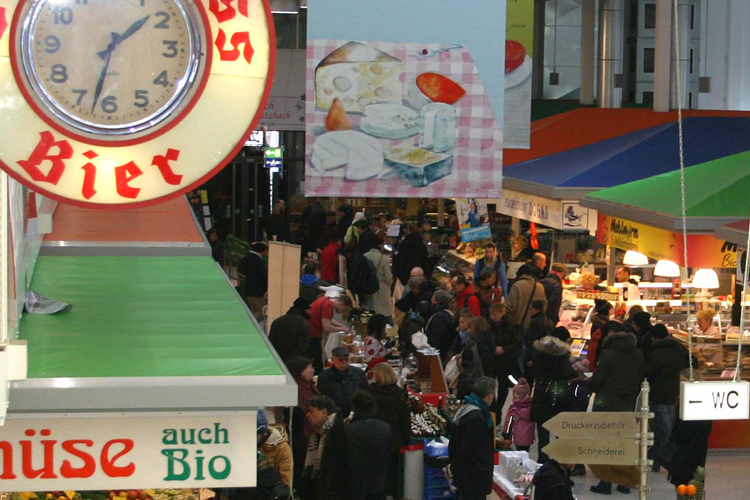 Since the start of the millennium the Marheineke market hall has developed into a shopping centre that is visited by up to 13,000 people on peak days. The product range of the nearly fifty merchants and restaurateurs is regional, seasonal and exclusive. Alongside foods, restaurants and services it also includes art, culture, a medical practice and a small hotel.